I cannot decide whether I like the name of this tree or the tree itself! 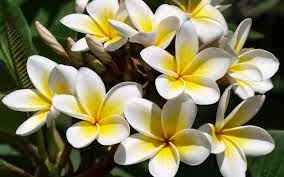 The Frangipani is the common name of Plumeria and the tree is a delight to behold in different seasons of the year. The name evokes sensuousness whenever I pronounce the name - certain words do that, you know. Someone once said that I was a sense-person, referring to my fascination with sounds, touch and smell. Well, I don't know where that person is or what the person is doing but still the words uttered have been etched in my memory (I say a little prayer for you!). Frangipani is such, it nudges certain settled sediments of memory and stirs the soul and does not hesitate in tagging our fragile senses. The tree is bare during the winter and flowers during the summer months - sometimes there are only flowers in the tree sans leaves and sometimes the entire tree is filled with flowers and leaves. The tree is a treat to my eye sans leaves, flowers as well. The tree emanates a fragrance at night, possibly to attract pollinators (I read this on Wiki). The tree is a true decorative element wherever it is found (except my wee garden of course, because I just stop with my admiration alone and do not tend to it!) Some objects of beauty are just lovely to behold but not to be taken care of, I reckon and that explains my lackaidaisical attitude in taking care of the Frangipani in my garden. This is a well loved tree/flower by many artists and beauty-lovers. The flower adorns many a pretty ear in Hawaii or simulators of the Hawaii feel ;) And, it comes in shades of off-white and pink. It is quite strange that it was once an exotic to India but now it is near-native. Everything thrives in India, you see. Another beautiful accessory to God's creation . . . Thanks for sharing, Susan! Blessings! True that, Martha. Glad to see you stop by. Happy Mother's Day to you and your children.